As an avid reader it would easier to share a list of books I won’t read. 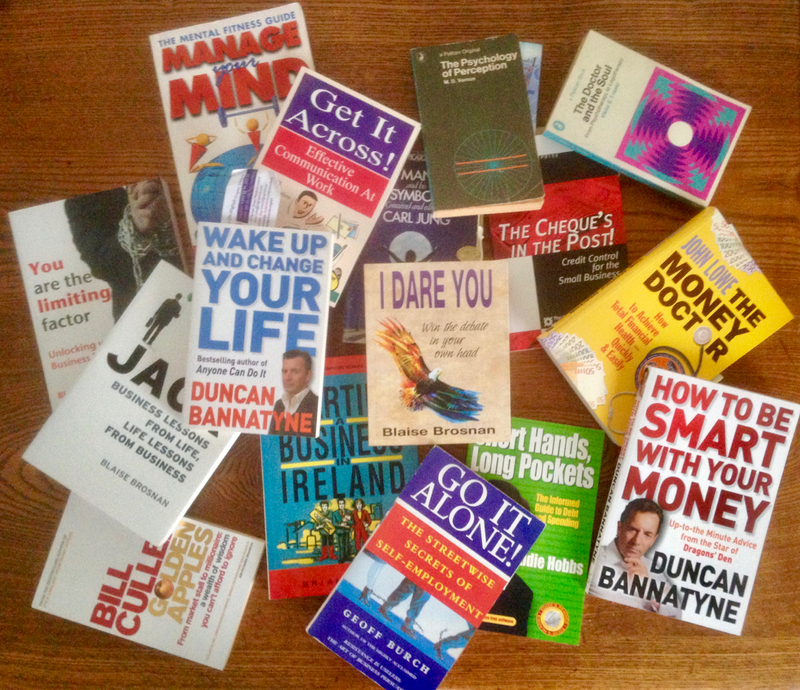 When it comes to the business of business & Design etc., I have quite a collection of advisors. Many articles in print, online & webinars performed by business influencers, advocate, ‘When stuck read a book’. Today we’re spoiled for choice when it comes to acquiring knowledge via the written word. Anyone with a little dedication, persistence and the where with all, can be a published author. Books are more accessible than ever before. We can purchase printed and digital versions from many sources. Traditional book shops to online stores such as Amazon even setting up stores on our websites. We can add Apps to our phones to read and purchase books via ‘Kindle’ (Amazon), ‘iBooks’ (Apple), ‘Play Books’ (Google) and independents such as Kobo Books also Apps developed for Offline stores such as Eason Ireland. •• Sony invented the first commercial eReader with the Sony Librie in 2004. its display could be viewed in direct sunlight and was readable in portrait or landscape orientation. The original Kindle device was introduced in 2007 Amazon later introduced Kindle software (Apps) for use on various devices and platforms, including Microsoft Windows, iOS, BlackBerry, Mac OS X(10.5 or later, Intel processor only), Android, webOS and Windows Phones and Tablets. As of 2011 there is also a “cloud” reader to allow users to read and purchase Kindle books using a modern web browser at read.amazon.com.•• Yes 😀 Kindle is a device & also software for others devices. We can read them on our Smart phones (Windows, iOS & Android), Tablets, Computers & naturally in hand. Self publishing has lead to a surge of subjects that traditional Publishing Houses would never have considered being commercially viable. Genre they would never have risked trying to sell. A book may have many owners before it reaches it’s demise. 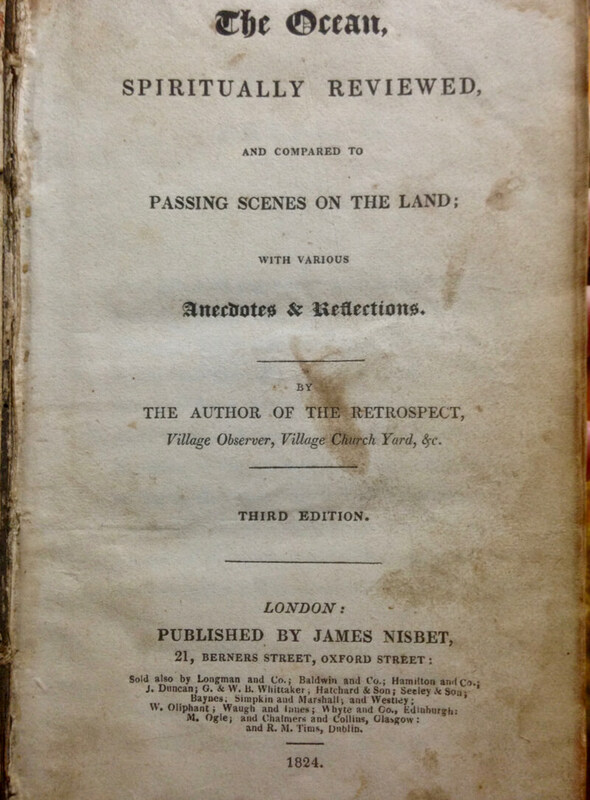 I have in my possession a third edition print, a book printed in 1824 ‘The Ocean’, Spiritually Reviewed and compared to PASSING SCENES ON THE LAND with various ANECDOTES & REFLECTIONS by the Author of the Retrospect, Village Observer, Village Church Yard &c. purchased in a thrift store. This title page is wonderful, a visual treat, certainly a child of its Typographic time. The Letterpress print process has debossed the text into the textured paper. The title is a ‘Blackletter’ Typeface followed by it’s centred subtitle which is typeset in 5 different Typeface, again including the ‘Blackletter display face. Are we to understand that the Author, Richard Marks is so famous or humble, as to not require their name to be included? The Publishers details are clearly given in various sizes below the edition notice then followed by the year 1824 . 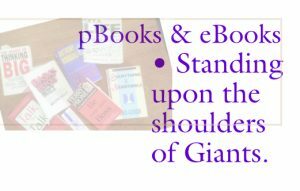 Most eBooks I’ve purchased are either copies of pBooks I already own, books, I regularly reread portions of & others that may be unavailable for purchase nearby or to borrow from the local library. In a hurry? Usually I can buy the book instantly online. A friend of mine once set about replicating their personal library in digital format for his 2006 ‘Sony Reader’. iBooks & Play Books give readers access to ‘Out of print’ and formerly copyrighted reading material. Many of which are free of charge. Often digital format are lower in price than their printed counterparts though occasionally more expensive. 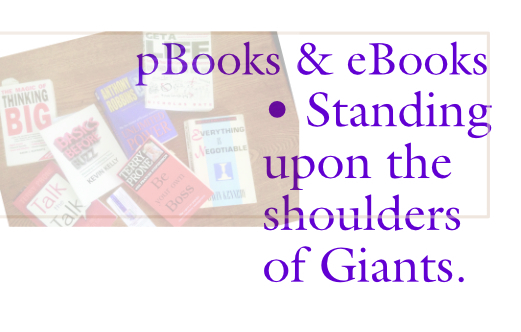 One advantage often mentioned of eBooks is that they are so transportable. ‘When going on holidays, I can take hundreds of books with me’. Personally, I might read, nearly two books on holiday, perhaps while waiting for transport. Reading more than that suggests it’s been a rather poor holiday. I would have been better off staying home amidst my creature comforts. Barring the possibility of a Libraries tour. That said recently when told I would have to wait 45 minutes for ‘The Saltee Chipper’, Kilmore Quay, delicious seafare, it wasn’t a burden passing the time rereading a few chapters of Napoleon Hill’s • Think and Grow Rich. Electronic books have the advantage of being able to utilise links to pages within the book being read, to additional information, videos, web pages, maps, virtual reality, and such as appropriate to their subject matter. That said published books can contain 3Dimensional, physical interactive elements such as popups, paper engineering parts along with having inserts of different sizes, textures, colours, details etc. Including coloured images in digital books can make the medium prohibitively large, which can reduce the effectiveness of the device used to read it. As a Graphic Designer the design of books in both forms are full of interesting challenges & possibilities. So as technology progresses only imagination is the limit. Where reading matter for entertainment, light reading ebooks have an edge over pBooks. Printed material being more suited to learning. For the most part reading digital media the human brain scans text & speed reads. Whether the text be online, digital articles or in their eReader App.. However when we read a book in study, to learn about a subject, we spend more time with the text. We mark areas, add coloured stickies, write notes in margins, slip notelets between pages etc., to assist memory or reference later. Similar markers are available in digital formats, however in practice, flicking back and forth between pages, chapters etc is something of a process. With a physical book flipping though pages is almost instinctual. Automatically as we read a physical book, the human brain takes note of the position of the text on the page, inter word spacing, the shape of words, essentially our brain recognises the page as a distinctive picture. This assist’s later when we wish to recall information. In the future printed books still won’t be the sole preserve of Academia. Some books are just better in their physical format. Why? Well reasons vary from person to person. For some the idea of not having a bound set paper leaves, they can happily mutilate the corners of as they progress through the tomb is unthinkable. Another person considers a particular genre is best read on their tablet. Ask and you’ll will receive a variety of answers. 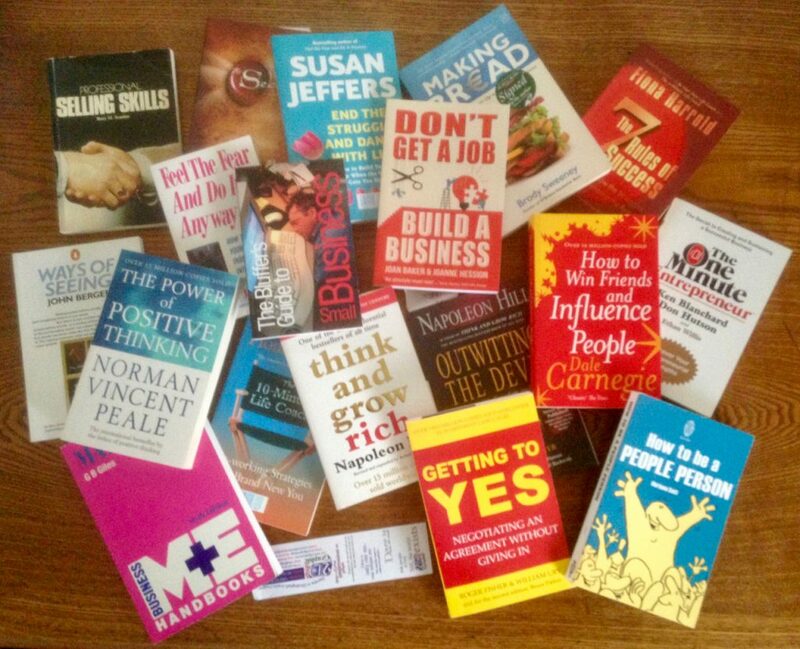 Few activities stimulate the brain like a book, the activity of reading, evoking emotions, firing the imagination, educating and entertaining. Clearly eBooks will not lead to the extinction of pBooks as predicted. Print & Electronic books are merely different formats available. Each a form that follows the desired function.